This Christmas give your friends and family the gift of cooking. Cookbooks are an invaluable source reference, inspiration and make the very best Christmas gifts. This year, Italian cookbooks are dominating the food section in bookshops. Nigella Lawson’s latest book, Nigellisma: Instant Italian Inspiration (£26), has been a huge hit and shows that Italian cooking can be simple and speedy and still produce no-fuss feasts. Then there’s Antonio Carluccio: A Recipe for Life (£20) by the larger than life TV chef and successful restaurant owner. The book details his life from his humble beginnings to the success he is today. Included in the pages are recipes that have shaped his life. Here are a few more cookbooks to look out for and may be just the thing to fill your stocking. Catherine Fulvio is one busy woman. As well as being the proprietor of the Ballyknoken House Cookery School she’s also one of Ireland’s top TV culinary stars and a cookery writer. In her latest book, she embraces all things Italian. Having a Sicilian husband, Catherine has gradually been seduced by the Italian way of life. In Italy, people live to eat, instead of eat to live. 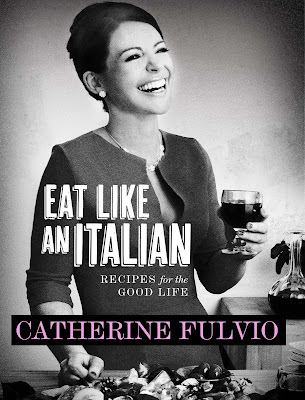 With the belief that Italians have the answer to long-lasting health and happiness because of their Mediterranean diet and so her latest cookbook encourages readers to adapt to the leisurely Italian lifestyle attitude. Recipes include lasagne rolls, plum and chianti soup, lamb stew with olives and lemon and unique ice-cream recipes such as fig, cappuccino and olive oil. A great touch to each recipe is that Catherine explains how the Italian recipes can be tweaked using local produce; for example, a risotto can be used with pear cider instead of wine. This book encapsulates all that is great about traditional Italian cuisine. Recipes encourage cooks and diners to eat, drink and be merry while also adopting the Italian philosophy that food is nourishment for the spirit as well as the body. Traditional recipes such as orecchiette (pasta shaped like an ear) with broccoli and agnello with salsa gialla (lamb in a yellow sauce) are presented with optional ingredients to be added or removed according to the various palates and tastes of family and friends. It’s an approach that reflects the heart of Italian cuisine. Tessa celebrates the heritage of Italy, the country she’s chosen to call home, in her latest book. It’s a rather whimsical book that pays tribute to the women in our lives – mothers, mothers-in-law, grandmothers etc. (in Italy, women are considered the heart and soul of the home). Important lessons in life are noted throughout the pages that every woman of any age will learn from. With recipes ranging from robust dishes for the family to quirky cakes and preserves, this book will become a precious heirloom to treasure. Italian dishes are famous everywhere in the world and it would be fantastic opportunity for everyone to get the recipe of various Italian food items. This seems a good learning content for it.